Image credit: Berlin Open Access Conference. The story of how we reached this decision is the result of interviews with digital HSS thought leaders (huge thanks to all of them) – Kathleen Fitzpatrick, Peter Brantley, Eric Kansa, Sebastian Heath, Leslie Chan, Ethan Watrall, Jessica Clark, Clemens Wass and Gemma Sou – some fascinating background reading and a healthy desire to educate ourselves on the different needs of those within the humanities and social sciences compared to the sciences and medicine, with which we were far more familiar. “It is very important in my opinion. I have been arguing since 2004 that OA brings the same benefits in every field, even if some fields present more obstacles or fewer opportunities. For example, the natural sciences are better funded than the humanities, which means they have more money to pay for OA. 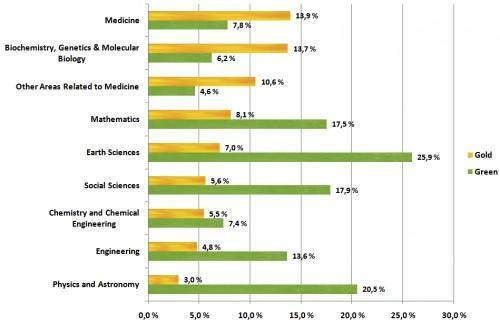 In particular, there is more public funding for the sciences than the humanities, which means that the compelling taxpayer argument for OA gets more traction in the sciences than the humanities. In addition, books are at least as important as journal articles for humanities scholars, if not more important, and OA for books, while growing quickly, is objectively harder than OA for journal articles. The good news is that OA in the humanities is growing – not faster than OA in the sciences, but faster than in the past. More humanities scholars understand the benefits and opportunities for OA, and are answering the objections and misunderstandings raised against it”. This graph from a 2010 PLOS ONE article (mirrored here on the ScienceOpen platform) digs a little deeper into this story and shows the relative balance of Gold Open Access (publishing in an Open Access journal) in areas such as Medicine and the Lifesciences in contrast to Green OA (self-archiving of journal articles in an Open Access repository). For background reading, I spent the best part of a long flight from San Francisco to the UK (10 hours!) making detailed notes from a number of sources. Firstly, “Open Access: a perspective from the humanities” by Peter Mandler, Professor of Modern Cultural History at the University of Cambridge. A White Paper entitled “A Scalable and Sustainable Approach to Open Access Publishing and Archiving for Humanities and Social Sciences” by K|N Consultants (Rebecca R. Kennison and Lisa R. Norberg).“Open Access and Being Human” by Martin Paul Eve, co-founder of the Open Library of the Humanities and Editor of the OA journal Alluviun. “The Next Obstacle for OA Publishing in the HSS: More Costs? Or the License?” by Andrea Hacker, University of Heidelberg, Germany. Finally, Podcasts can ‘level the playing field’ for researchers looking to break the mould and share accessible findings by Gemma Sou, the Institute for Development Policy and Management at the University of Manchester, U.K.
As Martin Eve so eloquently wrote: “Open Access could give the humanities fresh energy and public appeal through visibility. It could give us the chance to reach a broader audience and to fulfill the societal function of which we dream”. After completing my initial desk research, the next step was to interview some digital, open and influential HSS thinkers for myself to see if they corroborated or disagreed with the opinions expressed in my reading material. Despite my interview subjects being extremely busy, I was delighted to find that I readily secured interviews with the following people: Kathleen Fitzpatrick, Peter Brantley, Eric Kansa, Sebastian Heath, Leslie Chan, Ethan Watrall, Jessica Clark, Clemens Wass, and Gemma Sou. I am indebted to them all for their insights and appreciate their time. My interviews confirmed that, per my background reading, there appeared to be some hurdles to overcome if HSS is to fully embrace Open Access. As one interviewee said ““the knee jerk reaction to the notion that OA will work here, because it works there, is NO!”. “The Article” is not a universally shared unit of communication. In HSS longer formats such as monographs and books are the norm although interest in and acceptance of online articles is growing partly because there are no space limitiations in this format. Additionally, Reviews and other added value content are common place and not many OA journals offer this service. Similarly, “The Journal” doesn’t only carry the most important works and are less likely to be owned by huge for profit publishers but rather by socieites for whom they represent a valuable source of revenue. Profits from these journals can be slimmer with fewer longer articles without multiple authors to split the bill. “The Article Publication Charge (APC)”, which is typically paid by an author’s institution or funder in the sciences, is not ideally-suited to the varied publication formats of HSS. Also, “Article-Level Metrics” aren’t necessarily a natural fit in HSS although there’s clear interest in how to measure the impact of digital objects. In terms of licensing, there’s concern over the suitability of the CC BY license given the prevalence of the use of third party materials from protective museums and archives. My solution, from a science perspective, would be to license the authors work CC-BY and to secure relevant permissions and credit them as such (admittedly a pain to undertake). However, during my reading I discovered that certain museums and archives charge more for permissions in an OA journal and that issues surrounding commercial re-use of painstakingly created materials and the historical requirement for accurate attribution abound. Life is never simple. Finally but very importantly, Article Publication Charges (APC) as priced for the Sciences are not readily affordable to those working in HSS because of their low level of funding and inflexibility in terms of using grants to pay publication fees. Also, there seems no possibility of reserachers paying APC’s from their own pockets because of their frequently low salaries (and it wouldn’t be fair to expect this anyway). These points are neatly summarized by K|N Consultants who observed “In HSS, articles are not the only publication type of value or even the most valued type of publication; external funding for research is minimal or non-existent; and societies often consider their publications to be the primary benefit they offer their members, and many find it difficult to imagine how they would support their society’s activities if their current publishing operations were to change”. We recognize that ScienceOpen can’t “solve” for Open Access in the Humanities and Social Sciences but we hope these overtures will be welcomed by this community. Please continue this conversation by commenting on this post, find us at @Science_Open or email me.